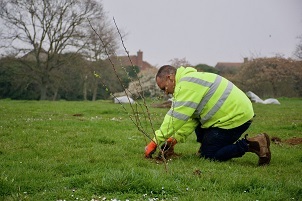 A total of 5,000 trees will be planted at the Rush Green Recreation Ground to improve air quality and biodiversity. The woodland will also serve as a revived open space for local residents to roam and relax in. The area where the trees are to be planted has not been used for sports pitches for many years, and would no longer be suitable due to the uneven nature of the ground there. Species to be planted include English Oak, Hornbeam, Field Maple, Silver Birch, Hawthorn and Wild Cherry, which will keep bringing a whole host of benefits to the local environment and communities, and grow in value as they age. The first trees began to be planted this week, with the rest being of the planting being carried out in the autumn by a combination of volunteer and community groups. Ian Taylor, TDC’s Head of Public Realm, said it was great news that Trees for Cities had backed Clacton in this way. “Planting will increase the amount of tree canopy cover in Clacton, improve bio-diversity and the area’s resilience to climate change,” Mr Taylor said. “It will also bring new life to a part of the recreation ground which can no longer be used for sport and give nature a helping hand. “We have already invested in the Rush Green Recreation Ground by refurbishing the changing rooms inside and out, and are looking to improve the site entrance and car park, the quality of at least one of the football pitches, and to work with the football club on improving the edge of the ground. Rory Field, Corporate Partnerships Director at Trees for Cities, said: “We are thrilled to be working with Tendring District Council on this project. “Trees make us healthier and happier and this woodland will bring massive benefits to the local biodiversity, community as well as sequestering greenhouse gasses, which will benefit us all. “The species being planted have been chosen for their qualities such as resilience and longevity.